Elizabeth, in her early twenties, lives with Adam, whom she has known and loved since high school, and though they have a convincingly evoked New Age lifestyle, with a small apartment, pink yoga mat, Buddha statue etc., Elizabeth cannot face herself in the mirror because she is afraid of the darkness in her eyes that threatens her sense of well-being and the validity of her apparently fulfilling relationship. 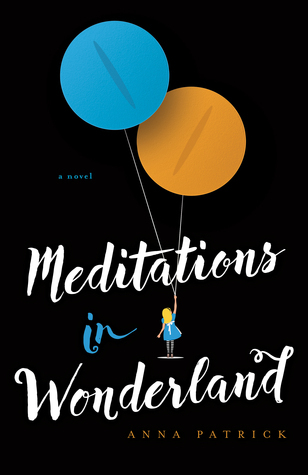 During her morning meditation, she falls into the blackness that is the equivalent to the rabbit-hole Alice falls down, but without the curiously unemotional response that Alice has. Elizabeth is threatened by a psychological fragmentation reflected in the recurring image of shattered mirrors, in which she sees herself as Alice, even though her dark hair contrasts with Alice’s blond tresses and their eyes are different colors. R.D. Laing’s classic The Divided Self shares many of the same psychological motifs with the novel. Complementary themes of awareness of others and of the solid reality of the self are evoked in various combinations; what Elizabeth needs to transcend is the tendency towards self-absorption that gets in the way of so many people’s ability to really see and hear others, and once she allows this perception of others to really register with her, she will also develop a strong, solid sense of self at her emotional core. Of the characters selected from Lewis’s novel, Tweedledee and Tweedledum present Elizabeth with an example of two beings without a firm sense of their own being, as they are dependent upon each other for their self-definition, and it is a large, ornately framed mirror that the two of them ineptly attempt to set up that provides Elizabeth with one of her early confrontations with the need to examine herself. The Cheshire Cat understandably becomes a major, though ambiguous, “spirit guide” for her, both in terms of his ability to appear and disappear, to play with the nature of his various appearances, and to give her double-edged advice that she can follow at her own peril. Ultimately, she must take the advice that is threatening to her perceived well-being, as she has to break through the facade that she has patched together over the years to hide behind. There are no cakes or bottles saying “Eat Me” or “Drink Me” to change her size, although before she falls down the hole of the darkness inside herself—Patrick acknowledges that Conrad’s Heart of Darkness was a major influence on the novel—she takes a pill, an “upper” to dispel her depression, as apparently she does regularly. Of the characters from the original novel, the Mad Hatter has one of the strongest appearances, though one that is very different from the Carroll; he is sitting at the table alone—no March Hare or Dormouse in attendance—and comes across to Elizabeth as a very convincing seducer, as if the temptation to fall into madness is very strong indeed for her. Patrick is evidently familiar with the practice of lucid dreaming, as revealed by Tweedledum’s statement that “you’ve woken up within the dream. You’re both awake and dreaming. You’re creating everything around you and playing out your own dream all at once” (80). A major struggle that Elizabeth has is to realize her will through this dream, in which she has only imperfect and intermittent control. As a lucid dreamer is one who is aware she is dreaming and can alter elements of the dream at will, but one who is only imperfectly in control may attempt but fail at controlling the dream narrative, Elizabeth occasionally remembers to be at one with her breath and to visualize what she wants to have available to her, but is only in control to a very limited and unpredictable degree. Elizabeth is on the cusp of happiness, of self-control, and that allows for a quest narrative in which she has certain powers available to her, but these powers are inconstant because of her lack of self-trust. The language and images used by the author in evoking Elizabeth’s personality and actions indicate a fine awareness of the yogic, meditative, and dream states of mind, within the context of which this novel takes place. For example, when Elizabeth is confronted by the bird that perceives the girl to be a snake—a possibility that is given far more weight than in Carroll’s original—she walks away from the bird. “Even after the nest and the tree were out of sight, she could still hear the bird faintly from afar, like a lonely car alarm echoing a few blocks away on a quiet night” (63), an eerily evocative way of establishing a sense of distance from a realm that seems anachronistic in the fictional context. The phenomenology of creative visualization, insofar as it is imperfectly manifested in one’s experience—and I can only refer to my own experience here—is explored consciously in a number of places. For example, reflecting upon “the scenes she tried to create in her mind,” Elizabeth recognizes that “those fell just short, the elusive dandelion seeds that floated through her fingers and just beyond her reach, the lightning bugs that lit up by your ear only to darken and reappear ten feet away” (105). This is a beautiful evocation of a mental image that doesn’t quite attain the clarity and stability that seem possible when reading Patricia Garfield’s Creative Dreaming or similar works of that genre. The awareness of such imaginational imperfection is further elaborated when Elizabeth visualizes a “big red arrow” pointing the way to the Mad Hatter’s Tea Party: “Elizabeth… saw a revision of her imaged creation… It was a sign, but not an arrow, nor was it any shade of red. Where her floating arrow had once been boldly erected in her mind now stood a wooden sign with scribbled writing etched across its surface” and along with the scribbled writing is a similarly scribbled drawing of a hand pointing the way “in the fashion of an old circus sign” (105-6). Elizabeth’s conscious intention to visualize a way to find the tea party has been subverted by the subconscious and transformed into a much more slapdash and much less official-looking directional sign. When I first read Anna Patrick’s Meditations in Wonderland, I was struck by R.D. Laing’s The Divided Self and its exploration of the fragmented personality as a painfully out-of-control and desperate, possibly suicidal, being; in going back through it and looking at the artistry of the literary work, I am now struck by the awareness of the visualization process and the interference the unconscious, as Trickster, introjects into the product. I wonder how many more layers this work may present, depending upon how open the reader is in approaching the text!